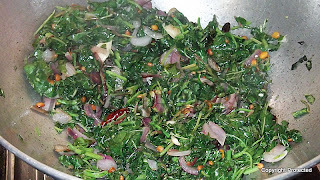 Green leafy vegetables, as we all know, are a rich source of vitamins and minerals. So it is good to include them in our diet at least thrice a week. There are many ways to prepare greens - poriyal/talimpu, pappu/kootu or sambar, masiyal, etc. 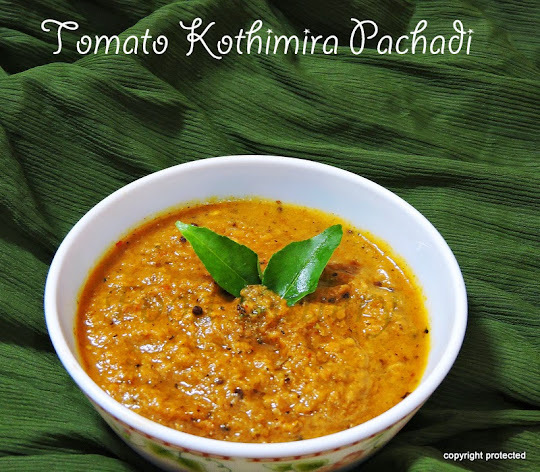 I have prepared a poriyal/talimpu here using Mulai keerai (also called thotakura in telugu or Amaranth leaves in English). 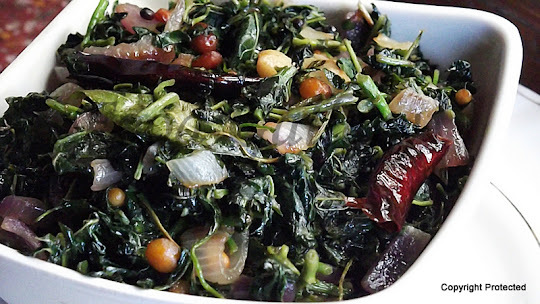 Both the leaves and tender stems of the plant can be used to prepare this poriyal. I have used mulai keerai here, but this poriyal can be prepared with any greens of your choice. This is a healthy and tasty side dish for rasam, sambar or just plain hot rice and ghee. Clean and wash the greens properly and chop both the leaves and tender stems finely and keep aside. Cut the onion into small squares. 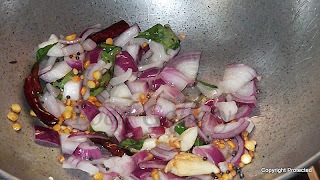 Heat oil in a kadai and add mustard seeds. When it starts to splutter, add channa dal and red chillies and saute till the dal turns light brown. Add garlic, curry leaves and then the onions and saute till the onions turn transparent. Now add the greens, stir well and cover with a lid. Cook on low flame. Add salt after the greens start to wilt. Stir in between so that the greens don't stick to the bottom. Check if the greens are cooked and remove from fire. Serve hot with rasam, sambar or just plain hot rice and ghee.